1. What are the limitations of trial version? 2. What to do when UltData cannot detect my device? 3. Why does UltData find no data in my device? 4. Why does the software not find all the lost data by scanning iPhone directly? 5. How to fix "Failed! Please eject iOS device. Then connect it to your PC and scan it again!" 6. Can I still recover the data after iPhone restore/factory reset? 7. Why cannot I find my lost data from iTunes Backup file? 8. How to import iPhone Backup File manually? 9. What should I do when I forgot my iCloud password? 10. Why do I get message "app name can't be opened because it is from an unidentified developer”? 11. What is UltData superior to iTunes? 2. Why does iCareFone need register again even when I registered it already? 3. How to fix when iCareFone cannot detect my iOS device? 4. How to fix when iCareFone cannot scan my Contact/Note/Calendar? 5. Can iCareFone help when I forgot my iPhone password? 6. Where does the backup from iCareFone store on computer? 7. How to repair operating system to fix iOS crashes, stuck, error and other severe system issues? 8. What to do when repairing operating system failed? 9. When I click Exit Recovery Mode, the screen keeps frozen for a long time, what shall I do? 10. Why failed to export photos using iCareFone? 2. What to do when UltData for Android cannot connect Android device? 3. What is Superuser Request and how to allow it? 4. How to download UltData for Android service (APK file) to my device? 2. How long does it take to search for a password? 1. How to create a bootable disk? 2. How to Boot Computer from Burned CD/DVD? 3. How to create Windows 7 repair disk? 1. How to fix “Firmware package and device model do not match. Please re-download the matching firmware” errors? 2. How to fix “Firmware verification failed! Please check up your network connection and try again”? 3. What should I do when the Repairing iOS system failed/Repair process stuck? 4. How to fix unknown error 9? 5. How to fix unknown error 4013? 1. How do I fix “Firmware package and device model do not match. Please re-download the matching firmware” error? 2. What to do when passcode removal process gets stuck in the middle? 1. How do I fix can’t log into iTunes account (Error 0x80090326)? 2. What to do when iTunes won’t install or update? 2. Why some of the files cannot be opened after recovery? 3. Why cannot I find all my lost files? 1. How to fix "Initiate drive failed" error in iGetting Audio? 2. What are the differences between PDF user password and owner password? 1. Is it secure to purchase from your website? 2. What is your license policy? 3. Can I evaluate before purchasing? 4. Can I order without using a credit card? 5. Will I get physical copy of the software paid? 6. What is Download Protection? 7. How do I know whether my order is processed successfully? 8. Can I cancel my order after placing it? 9. What should I do if I purchased the wrong product? 10. Why was I charged more than the price listed on the website? 11. What is your upgrade policy? 1. Why do I not receive the registration code e-mail after purchase? 2. How to register Tenorshare software? There are no functional differences between the trial version and full version except that the trial version only allows scanning and previewing data, but not allows recovering data to computer. After you purchase a license and register the trial version successfully, you will be able to recover the data without limitation. -Unlock your iPhone/iPad/iPod firstly if you set a passcode. -If you see “Trust This Computer” dialog appears on your iPhone, please click Trust option. -iTunes should detect your iPhone without any warning message. Please check whether you encrypted the iTunes backup so that the software failed to access data in your iPhone. Click here to check how to disable iTunes backup password. Generally the program should find all lost data without time frame; whereas, if you continue to use the device after data loss, the new data will overwrite the deleted data gradually to free disk space. The longer time the data were deleted, the more possible they've been overwritten. It is recommended not to use the device when you lost important data. If you have backed up the data in iTunes or iCloud before, please switch to Recover Data from iTunes/iCloud Backup File mode to retrieve your data from backup. 1. Check whether you turned on the Find My iPhone on the device, if so, turn it off and try again. 2. Check and make sure there is enough available space on local hard disk. 3. Change a different USB cable to connect the device. The restore or factory reset will erase all data in iPhone and make iPhone a new device. In this case, you cannot recover the lost data from iPhone directly. Good news that iPhone Data Recovery can retrieve data from iTunes and iCloud backup file. 1. You've synchronized the iOS device with iTunes after the data loss, and thus the iTunes has updated the backup file by erasing the former data. 2. You've not backed up the data with iTunes before data lost. If you deleted the data not long ago, please try Recover Data from iOS Devices. When you do not save the backup file in the specified path, you can click Import Backup File option to import the backup file manually. The "~" represents your Home folder. If you don't see Library in your Home folder, hold Option and click the Go menu. 1. Go to the My Apple ID website and follow the instructions to reset your Apple ID password. For more information, see the Apple Support article Apple ID: Changing your password. 2. After changing your iCloud password, make sure you update it on all your devices and in any email apps you use to get your iCloud email. On your iPhone, iPad, or iPod touch: Go to Settings > iCloud, then tap your iCloud account. On a Mac: choose Apple menu > System Preferences, then click iCloud. On a Windows computer: Open the iCloud Control Panel. In your email apps: Check the help provided for the email apps you're using. If you set up iCloud on your iPhone, iPad, or iPod touch, make sure to set up a passcode lock on your device (Settings > General > Passcode Lock) for added security. Important Note: If you use the same Apple ID for iCloud as you do with other Apple services such as the Apple Online Store, iTunes Store, Mac App Store, or to purchase products in iPhoto or Aperture, changing your iCloud password also changes your password for these services. Make sure you sign in to those locations using your new password. This is Gatekeeper messages, and you can fix this by changing the Security&Privacy settings on your Mac OS X. Click here to read more. UltData scans iTunes backup and allows previewing data in details. Moreover, you can restore data selectively from iTunes backup to local computer. Only the Files Manager is free for trial users. Other features like Speedup & Clean, Backup & Restore, Ads Remove, Fix iOS Stuck, Repair Operating System are not available in trial version. You need to purchase Tenorshare iCareFone to enjoy all the benefits of the software. You should run this program with Administrator. 1. If your device is in normal condition, you should unlock your iPhone/iPad/iPod firstly if you set a passcode. If you see “Trust This Computer” dialog appears on your iPhone, please click Trust option. Ensure that you have the latest version of iTunes, if iTunes can’t recognize the device, uninstall and re-install iTunes. Use the USB cable that comes with the iDevice, plug the USB cable into any available port on your computer. Unplug and re-plug in the device, reboot the device and plug in again. 2. If your device is stuck in recovery mode, you can select “Fix iOS Stuck” function and click “Exit Recovery Mode” to exit recovery mode. 3. If your device performs abnormally like stuck at Apple logo, boot loop, black screen and so on, you need to repair the operating system with "Repair Operating System" function. Please check whether you turned on these file types in iCloud of Settings. Open Settings on your iOS device>iCloud>Contacts>move the switch to OFF. Click Refresh button on Tenorshare iCareFone to scan again. iCareFone stores all backups separately on computer. We store the backup file to the same location where iTunes backup file locates. 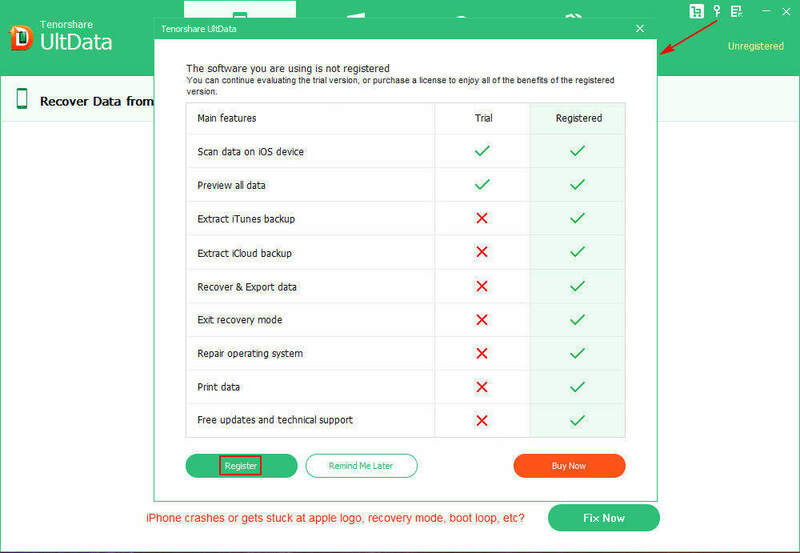 The “Repair Operating System” feature in iCareFone offers an ultimate solution to fix iOS issues like random crashes due to system file loss, iTunes errors, and 50+ iOS stuck issues (apple logo, endless reboot, connect to iTunes screen, etc.). No data will be lost. If you receive error message during operating system repairing, here are some suggestions for your reference. Please make sure that your iTunes is the newest version. If you import the firmware manually, verify if the firmware package matches the device model. If you download firmware online, this option will download the latest firmware package from Apple website. We recommend you to use Standard Repair, which will not cause data loss. If the problem persists, we recommend you to try 3-5 times to increase the success rate. Whereas, if your device is in worse circumstance unfortunately and cannot be fixed with Standard Repair, please switch to Deep Repair. All data will be wiped using Deep Repair, therefore, you’d better make a backup of your data before start deep repairing. Normally, the program will make your device exit recovery mode successfully after waiting for around 20 seconds. If the screen keeps frozen for a long time, please close the program and restart it to have a try. If Fix iOS stuck cannot resolve the issue, please go to Repair Operating System to fix your iOS issue without data loss. It might be because My Photo Stream or iCloud Photo Library in your device is turned on and you selected Optimize iPhone Storage. Click here to read more. The trial version works the same exactly with the purchase version except that the trial version does not allow you to recover the data to computer. Please enable USB Debugging on the phone following the onscreen instructions. Superuser, is also known as root, can access all files in your phone and have administrative permission. In order to get Superuser permission, you need to root the device first. Download Tenorshare UltData for Android APK and Tenorshare UltData for Android for Mac APK, and check how to install APK file to your Android device. The trial version allows you to search for iTunes backup password.When the search completes, the trial version only displays the characters of the password in asterisk. You have to purchase a license and the program will continue helping you crack the password. The scanning time depends on many factors including password length, password complexity, attack settings you set, as well as computer configurations. Generally the longer and more complicated the password is, the longer time the search requires. To speed up the process, you’d better use the second or third attack method and give as much info about the password as you can recall. You can create a bootable CD/DVD or USB Flash Drive for all Windows OS. Click here for detail instructions. Here is an article to give guide on how to boot computers from different supplier and runs different Windows versions. Please choose to download the firmware online, not to import the firmware. Please delete the firmware in your list or browse a new path to save the firmware. And you can also click “Copy” at the bottom of the interface to download the firmware through browser. First, check if you have already registered ReiBoot or re-download ReiBoot. Second, open IE browser>Internet option>connection>LAN settings, do not choose any options. ReiBoot contains 2 repair modes, which are Normal mode and Advance mode. If the problem can’t be fixed by normal mode, please transfer repair mode. Normal mode will not erase your data. Error 9 causes by many reasons, included battery and CPU these hardware problems. ReiBoot will help you solve the problem if the problem is software issue. Firstly, please ensure your iPhone has fully charged. Use original USB cable connect your iPhone to computer. If your computer is desktop computer, please connect it to the USB port which behind the motherboard. Error 4013 generally causes by USB cable or USB port problem. Try to use a new cable and change an USB port to try more times. If your computer is desktop computer, please connect it to the USB port which behind the motherboard. This error occurs when the firmware is outdated, there are two options for you to download it online. Click on “Download” to start downloading through our program, or tap “Copy” button to download via browser. Then import the downloaded firmware package to get started with repair. Firstly, please check your USB connection, make sure everything is working correctly. Original Apple USB cable is recommended. Secondly, check the status of your device, if it’s stuck in recovery mode or Apple logo, please contact our support staff for instant service. - Click "Repair iTunes" to start downloading iTunes drives for repairing. - After downloading the repairing drives for iTunes, Tenorshare TunesCare will automatically start to repair your iTunes. After repairing, you can log onto your iTunes account now. - Click on "Fix All iTunes Issues" to download repairing drive for iTunes. - The repair process will start automatically, after that, you will be able to install and update iTunes with no problem. You can scan data and preview files freely with trial version; while it recovers 500MB data for free. For data that exceeds this size limit, you need to buy a license. This happens because the original files have been corrupted. Once you realize you lost the files, please do not add any new info to the hard drive or card to avoid data overwrite or corruption. When we deleted files, there are still segments store in the hard drive or memory card, so that the recovery software can retrieve the lost files back; whereas, if the deleted files have been overwritten, they are unrecoverable. The user password, also called open password, is used to prevent people opening or viewing your PDF. The owner password is set to keep other people from printing, copying or modifying text, adding to deleting pages in your PDF files. Yes, don’t worry about that. Your privacy is guaranteed by us when you are browsing our website, downloading our product or making an online purchase. We provide Personal License and Unlimited License. Personal License is limited to install our software on three personal computers for use; while the Unlimited License allows purchaser to install the program to unlimited PCs. Yes, we provide trial version for all programs with very few functional differences from the paid version. Limitations of specific product can be found in Technical FAQs. In addition to credit cards, we accept checks, PayPal, Money Orders and Wire Transfers. You can choose to pay by check or Money Order or Wire Transfer on the payment page. There is specific guidance for you to process the order. As software developer, we only provide download version for purchased customers. If you need a physical copy, please add Backup CD in the shopping cart with extra charge. This Backup CD is charged and provided separately by our payment partner. The Download Protection is an extra service that is provided by our payment partner, who stores a back-up copy of the software that you purchased on server for two years. Check more info here. It is not necessary to purchase this service since we update software periodically and always provide free downloads and updates for purchased customers. Click Remove button in the shopping cart and update the price will free you from being charged for this service. Generally you'll receive the order confirmation e-mail within one hour after the order processed successfully. We recommend you check the SPAM/Junk folder. If you do not receive the registration e-mail after several hours, please contact our support team, and attach your order information. Our support staff will reply within 48 hours on weekdays. Once an order has been processed successfully, it is not refundable, due to the automatic order process system. Please contact the support people to exchange by paying price difference; or you can purchase the correct product and then request refund for the wrong order. As software developer, we only charge the price as list on the website. For the extra part, it might be the tax or Download Protection (Extended Download Service). What is Download Protection/Extended Download Service? EDS (External Download Service) is a service provided and charged by the payment platform separately, which lets you store your software download on a secure server for backup purposes for two years. Is it necessary to purchase this service? Honestly it is not necessary. We provide free downloads and updates for our purchased customers. Go to our official website to download the latest version, or contact us freely. How to get refund of EDS? Tip: Please provide your order ID and specify that you'd like to refund the EDS (External Download Service) only, not the software. We provide free upgrades for purchased customers. If the upgrade requires new registration code, please contact our support team and attach your order info for quick answer. Tenorshare values every customer that comes to us and puts customers' satisfaction as the top priority. To achieve this, we are working continuously to provide customer a pleasant experience with better software and service. All Tenorshare software can be tested with a trial download. The trial version offers free scan and preview with only a limitation of no recovery or export. This should help users to determine whether the software works as expect and satisfies purchase demand. 2.Change of mind after purchase. 4.Did not receive order confirmation e-mail and registration code in time, and didn't try online support or contact staff assistance. 5.Request refund for technical trouble, but fail to cooperate by providing details for troubleshooting. Generally you'll receive the order confirmation e-mail within one hour after the order processed successfully. The confirmation e-mail includes your order details, registration information and download URL. Please confirm you placed the order successfully and checked the SPAM folder in case it has been tagged as SPAM. Take UltData for example. Click the key icon on the top right menu of iPhone Data Recovery, and click Register option in the popup window. In the Register window, please enter the License Email and License Code (Registration Code) that you receive in the confirmation e-mail. Both e-mail and code are case sensitive, you'd better copy&paste and delete the trailing blank. Preguntas frecuentes sobre funcionamientos de producto, problemas técnicos, etc. Recupera tu código de registro por email o número de pedido. Ponte en contacto con nosotros ([email protected]) para obtener ayuda.